Welcome to the Painted Lady. We have an acre of land under Gewürztraminer vines, planted on July 13th 2006, here in Skull Valley, Arizona, in the Central Arizona Highlands, at an elevation of 4,400ft. This is a labor of love – love for the land, love for the outdoors, love for growing, love of wine, love of friends and family with whom we share this dream. Gently persuaded by our friend and vintner, Eric Glomski, to convert an acre of invasive weeds to an acre of vines, we are now committed growers, and do what every farmer anywhere ever did – we worry about the weather, about insects, about disease in the vineyard – but because of that we are more aware of the natural world, in all it’s glory and with all it’s glory flaws! We grow organically and we watch 750 “children” grow with concern and with care. On August 30th, 2009, 20 wonderful friends arrived at 5:30am to help us with our first harvest: .30 ton, Brix 21.7, pH3.5. 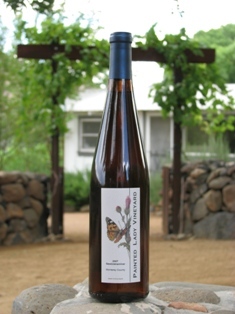 This was blended with Gewürztraminer grapes from southern Arizona to make our first ever 100% Arizona Gewürztraminer wine. In 2012 we harvested a ton of grapes and our 2012 vintage is entirely from our own vineyard. It is crisp, fruity, and beautifully dry and delicious. Its the perfect white wine to be chilled and served alone, on a beautiful summers evening outside, or with spicy Thai-type foods or smoked salmon or creamy foods that do well with a contrast cleansing sip of wine! 2013 saw just a slight drop in our harvest quota due to late monsoon rains and some insect damage to the grapes themselves from large, beautiful, dusty green beetles! So we were careful with our selection of bunches. But we think the flavor from letting the grapes hang a little longer, thus developing the aromatics that Gewurztraminer is so famous for, will simply enhance the vintage. 2014 was very strange! Very low winter rains, and an incredibly early warm spring. As I try to manage for our particular site I left more buds on the vines when pruning, thus had alot of shoot pruning to do. Next I had to thin the clusters and probably thinned too much – oh dear! We harvested mid-September and reaped less than a ton, but the resultant 2014 wine is full-bodied yet with good acidity, and wonderfully aromatic. We will bottle on April 23rd, 2015. Cheers! Copyright © 2009 Painted Lady Vineyard. All Rights Reserved. Designed by The Computer Guy.